It has been a while since I've had the urge to do anything crafy and handmade... but when I stopped by Trader Joe's the other night (after forgetting my chico bag) I was taken by how cute their Holiday paper grocery bags were. I felt compelled to use them again and after some card stock and double-sided tape, I now have gift tags to use for Christmas! brilliant! You should send this to Grace at d*s. I think she would like it as a holiday DIY. raya just sent me your blog link. i had no idea! so happy to find you! yes! 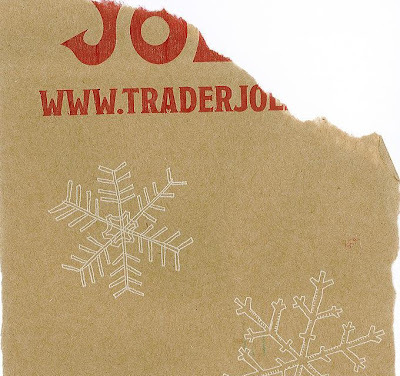 i was just @ trader jo's last week and was admiring the white-on-kraft-paper look myself. I love these! Can you post more specific instructions for those of us that are totally uncreative? Plummie - Of course! Sorry, I didn't really list any instructions! 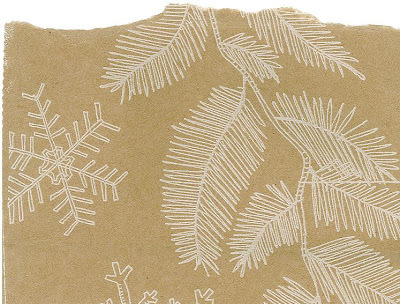 -Cut out large pieces of the bag that you want to use (Whole Foods has cute bags too). -If you have a steady hand, you can try to cut the shape of the tag freestyle. Otherwise, with a ruler, draw out the shape of a tag (or circle, square, etc). Once you have one cut out, you can use it as a template for the others. -Find the space on the bag you like, cut out the approximate size and use double sided tape or glue to attach the cardstock to the back. -Cut the excess bag from around the edges of the cardstock. -Use a hole punch (I didn't have one, so I used a pair of sharp scissors) to poke a hole. -I used old school hole reinforcers (think 5th grade) around the edges, but that's not really needed. Hi! I just found this post on d*s and am a supervisor at tjoes in Minneapolis. I'm going to have our artist make some and post the instructions for our customers to see! Brilliant? More like obvious. Way obvious. 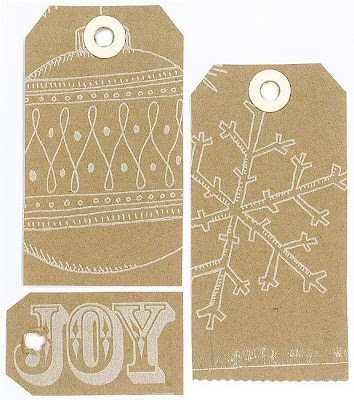 I have spent the last 2 days making gift tags of all shapes and sizes... they are beautiful! These are stunning - thanks!